Although I loathe mornings in general, my preferred time of day is amazingly the half-hour after my alarm rouses me at 6:45…and again at 7:00 (thank god for Snooze). I pour coffee, lighten it with a heavy-handed splash of milk and collapse to my sun-warmed dining room floor. For 20 minutes, coffee in hand and surrounded by a potpourri of toys and foil balls and twist ties, I lazily play with my kitties, Mochi and Wasabi – a purr, a rub behind the ears, a gentle bite, a pounce. This morning, as they dashed about their kitty tent (yes, they have too many things! ), I realized this moment merely lacked a wedge of almond-covered blueberry coffee cake. Coffee, cake and kitties, oh my! Preheat oven to 350 degrees and grease an 8” springform pan. Combine zest, egg, buttermilk, butter and vanilla. Add to dry ingredients and gently stir to combine – don’t overmix. Spoon 2/3 of the batter into pan. Sprinkle 1 T. flour on blueberries to avoid them sinking. Cover batter with brown sugar and blueberries. Spoon the remaining 1/3 batter on top. Sprinkle with demerara sugar and sliced almonds. Bake for 40 minutes or until golden brown and a toothpick inserted comes out clean. 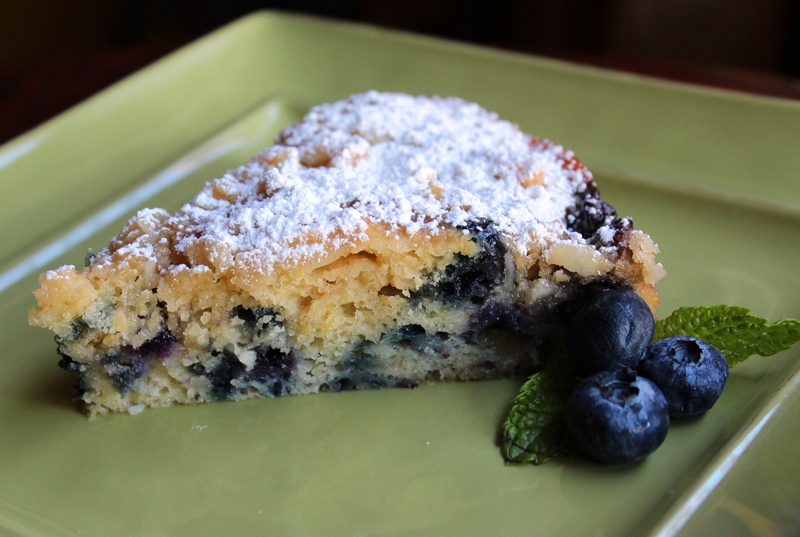 This entry was posted in Breakfast and tagged baking, Blueberries, Blueberry Coffee Cake, breakfast, coffee cake, mornings, Recipe by Julie "Phoren" Seyler. Bookmark the permalink.